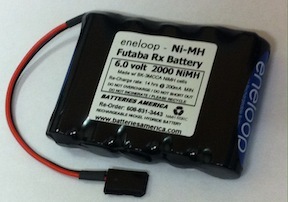 5HR3UTG2000W : 6.0 volt 2000mAh AA-size SANYO ENELOOP NiMH Receiver Battery, PRE-CHARGED & READY TO USE. 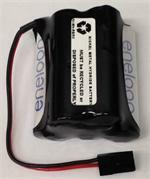 5BK-3MCCAW: 6.0 volt 2000mAh eneloop rechargeable Ni-MH receiver battery packs. PRE-CHARGED & READY TO USE. Made with 5 x eneloop 2000mAh AA-size cells. High-quality, high-capacity, memory-free, & long storage life. They RETAIN THEIR CHARGE when not in use! Choose Pack Shape, and choose wire leads or Connector from scroll-down menus. These premuim-quality battery packs are made by US right here in the USA !! Pricing reflects options chosen. DImensions of flat pack: 2 7/8" x 2" x 0.6". Weight = approx. 4.8 ounces. Enhancements / Add-on Options: NEW - extra EC3 (blue) Charging Connector can be added for $6.00. This heavy-duty Charging Connector comes with 16GA wire, about 8" long. See menu choices when ordering. Recommended chargers: YT-0006S, UP100AC, HiTEC X4AC Pro. 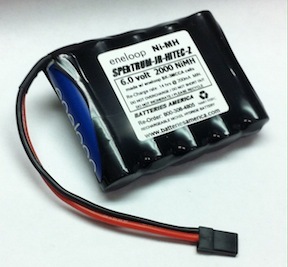 4BK-3MCCAW: 4.8 volt 2000mAh eneloop NiMH AA high-capacity receiver packs. Made with 4 x eneloop 2000mAh AA-size cells. Choose shape, Connector, Wire Leads, etc. 4BK-3HCCAW: 4.8 volt 2550mAh eneloop Pro rechargeable receiver battery for RC. PRE-CHARGED & READY TO USE! Choose flat Shape or Square shape, and choose Connector (or Wire Leads).